Manangatang and District Pre School has run as a part time organization for over 30 years. The centre is situated in the northern Mallee region of Victoria, Australia with our nearest major centre (Swan Hill) 100km away. We have a very active Parent Committee and a supportive group of parents who fundraise and work very hard for the children each year. Our local community and businesses are extremely supportive of fundraisers organised by the Pre School and we are famous for our Melbourne Cup Day Lunch and Christmas Eve BBQ. Manangatang and District Pre School delivers 15 hours of Pre School per week (3 x 5 hour days) to 4 year old children. Three year old children join the session in mornings nominated by the Director and families. The Pre School program is based on Emergent Curriculum that arises naturally from adult-child interactions and situations that allow for ‘teachable moments’. It allows the children to discover the world around them by encouraging them to explore life through their own interests and passions. The program is developed following class meetings, items/experiences brought from home, documentation such as the Group and Family Share Books and stimilus experiences provided by the educators. eg stories, excursions, songs, art, guest speakers. The service is under the direction of an Educator and Co-Educator. The operating hours for Manangatang and District Pre School are 15 hours per week in line with Government recommendations. Children can access the centre via the DEECD school bus service with permission for the Principal of Manangatang P-12 College. 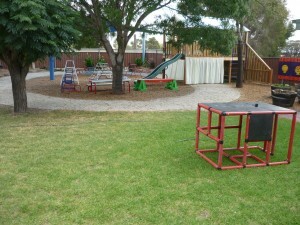 Our centre operates similar to a school in that we are closed during school holidays and on public holidays. Our three and four year old groups are currently combined and would remain so unless the enrolment numbers for any given year exceed 20. Three year olds currently attend the morning session of the program and days agreed upon with the parents. Manangatang and District Pre School achieved an overall rating of “EXCEEDING National Quality Standards” in every area. For those who are unaware of the rating system this is ‘as good as it gets’.